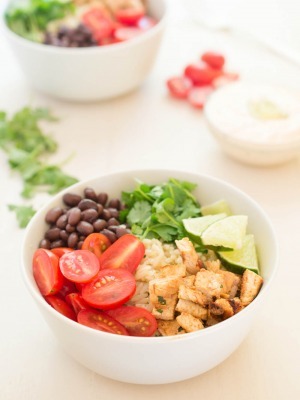 Super Easy Chicken Burrito Bowls. Made with homemade salsa, cilantro lime rice and grilled chipotle chicken. Perfect for meal prep! 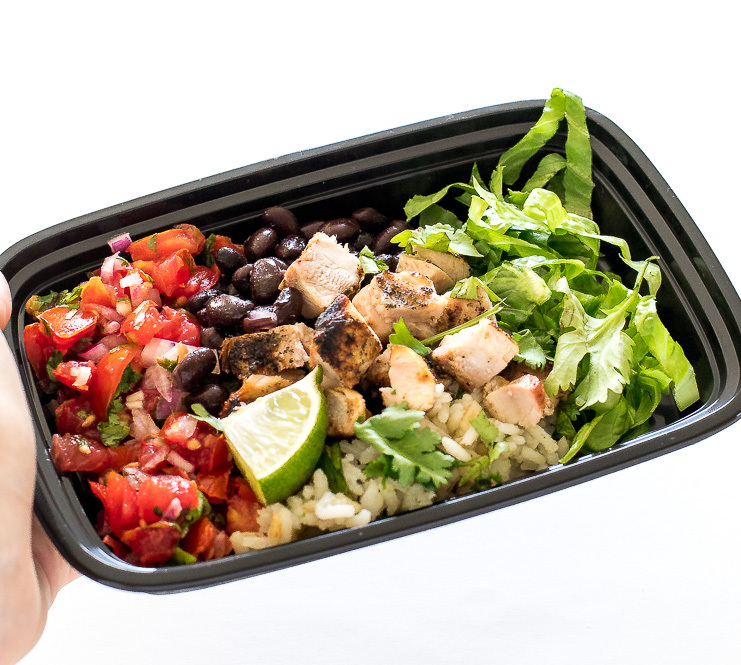 This Chicken Burrito Bowl is way better than Chipotle’s. It is loaded with flavor and tons of fresh ingredients. It’s also the perfect meal to prep for lunches! I loaded the burrito bowls up with homemade salsa, black beans, cilantro lime rice, grilled chipotle chicken and shredded lettuce. Everything you love about a burrito without the tortilla. The base of this burrito bowl is my Cilantro Lime Rice. I brown the rice in hot oil then toss in lot’s of garlic. 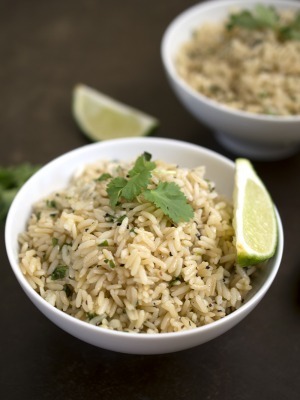 The rice simmers for 20 minutes in chicken broth then gets tossed with fresh squeezed lime juice and cilantro. I marinate the chicken overnight with some chilies in adobo, lime juice, seasoning and a bit of oil. The chicken is amazing! Little effort for tons of flavor! The chicken has a smokey spicy flavor thanks to the chiles in adobo sauce. When everything is prepped I assemble into meals and store in the fridge for up to a week. It is the perfect grab and go lunch or a delicious dinner! Add rice and cook until golden brown, 3-4 minutes. Stir in chicken broth, cover and simmer until tender about 20 minutes. Fluff with a fork and stir in cilantro and lime juice. Combine all of the ingredients in a medium bowl. Season with salt and pepper to taste. Refrigerate until ready to serve. Add all of the ingredients including the chicken thighs to a large ziplock bag. Sprinkle with a little salt and pepper. Toss to coat the chicken and marinade for at least and hour or overnight. When you are ready to cook preheat the grill to 400 degrees and spray the grill with non stick cooking spray. Remove the chicken from the marinade and grill flipping halfway until fully cooked. Allow the chicken to rest on the cutting board before cutting into it, I usually wait 5 minutes. Cube the chicken into bite size pieces and set aside. 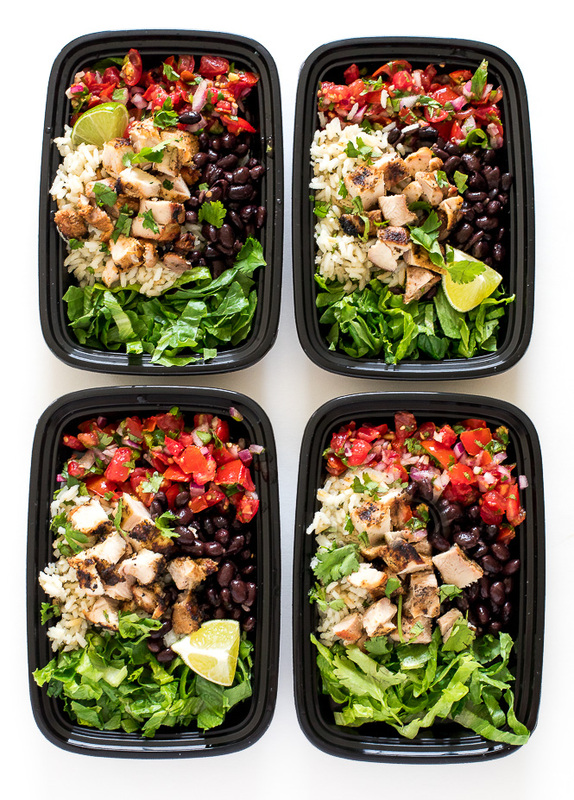 When you are ready to assemble layer the cilantro lime rice, black beans, chicken, salsa and shredded lettuce. Top with any other favorite topping. I like jalapeños and sour cream. Serve immediately or package into airtight container for meal prep. This looks really good. I’m going to have to try this one! 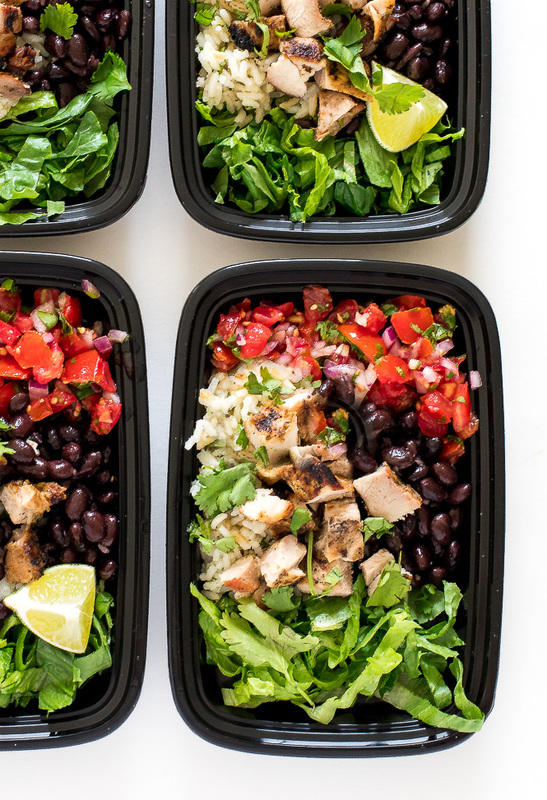 When making Meal Prep Bowls for lunch, do you reheat? If so, what is the best way to do so? Thanks Gene!! I actually didn’t reheat mine I just ate it cold. It was delicious like that!! If you prefer to reheat I would microwave it for a couple of seconds to take the chill off of it. Hi there! This looks delicious. I was just wondering, about how many servings do you put in eat container? I’m trying meal prepping for the first time and wanted some suggestions! I just eye balled it and divided it between 6 containers. That should be the perfect amount! 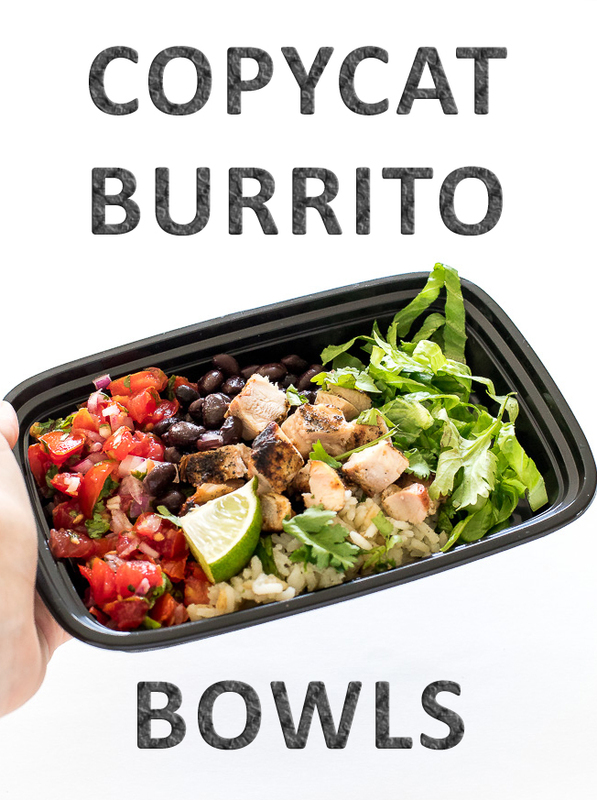 I would like to make burrito bowls for a graduation party. Do you have any suggestions for prepping and serving the chicken? Can I make ahead? Yes you can definitely make the chicken ahead of time I would say a day or two should be fine. Can you substitute white rice with brown rice and cook it the same way? The brown rice would probably need to cook longer. I would look at the package directions on the bag. Do you know have an estimate of the nutrion facts for this meal? For example the amount of calories, total fat, protein etcetera? If not, how would I be able to determin this for this meal?